Not just performance precise handling skis, but these models incorporate the latest DUALLY or WOODYS dual carbide ski runners, expensive, however the results, when you encounter a rutted trail is just astonishing. These carbides also widen not necessarily the "ski stance" of the snowmobile so equipped but they do widen the bite...the outside to outside carbide measurements. The BITE is a measurement that you can feel by "the seat of the your pants" just like when the one of the main manufactures changed from 38" c-c to 40' then 43" in '99. The addition of these duallys on our Fire Cat were like night and day. SNOW TECH articles referred to crucial adjustments, and then at a later date these Dually carbides were added. (installed at the 4000 mile mark) And no the original carbides are not shot! I had been sitting on these carbides for over a year. I finally installed them for the trip to Little Bear in '07! What a miracle, buds commented that Yours truly rode the Fire Cat into the corner for the first time like other sleds we've had in the stable. We started with some of the original rocker shaped performance skis from the beginning. 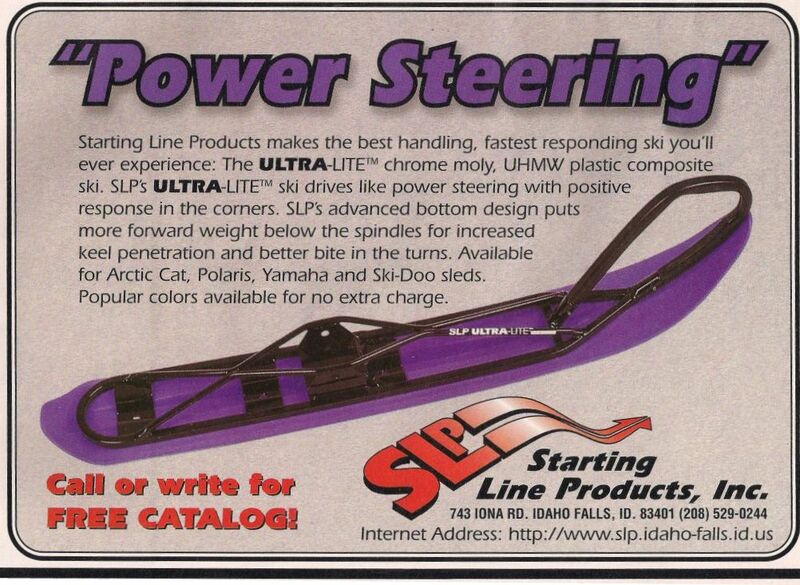 This extraordinary ski saver set up is NOT used on any Snocruise snowmobiles!